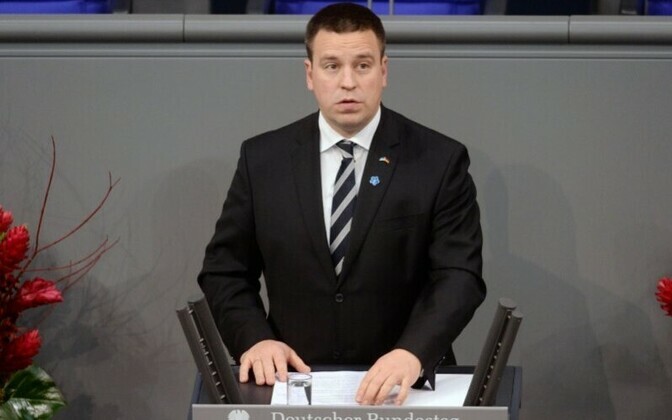 Addressing the Bundestag on Germany's National Day of Mourning on behalf of the Estonian presidency of the Council of the EU on Sunday, Prime Minister Jüri Ratas (Center) said that all of Europe must contribute to and take responsibility for lasting peace. "We are living in fortunate times of peace," Ratas said according to a government press release. "It is the European Union that has made a remarkable contribution to this peace and understanding; its very existence has allowed countries and peoples to be brave and exercise all our shared freedoms. We must be aware and make others aware of this every day, and safeguard what we have created together, which is something remarkable and unique." Europe takes peace for granted, found the Estonian prime minister, but it is the most important thing — not just in Europe, but in the entire world. "It was not so long ago when a part of Europe was banished to a dark cave — when we feared we would never be able to break free," Ratas recalled. "It was called the Cold War, although the political situation was hot in almost every corner of the world." But the wall came down and Berlin was reunited, he continued, demonstrating to the world the creative and restoring power of conciliation and forgiveness. "Once again, two halves of Europe found each other and the long-term agony was finally over for Estonians and many other nations," he said. "Today we are here, in peaceful, beautiful and insightful Berlin, to honor and remember the victims of all wars, armed conflicts, and terrorism," Ratas said. "We are here to speak about life and death. To speak about us. It is always the right time to have difficult conversations and brave deeds because we can never be liberated from things we dare not speak about." Germany has understood this better than most, leading the way to conciliation and reconciliation, Ratas highlighted. Quoting former Chancellor Helmut Kohl, who died in June, he noted that a Europe strong enough to secure peace on its continent could also make an active contribution to world peace. "In three months, on Feb. 24, the Republic of Estonia will celebrate its 100th anniversary," Ratas said. "As a small nation, we are ever so proud and happy to be celebrating this milestone. However, we are also aware that everything could have turned out differently. I often think about our painful past looking at the portraits of the first heads of state of the Republic of Estonia; their lives were cut short mostly during the Second World War." According to the Estonian prime minister, it is easy to state that wars are inevitable due to the aggressiveness of human nature, but wars have in fact been political decisions, not the unavoidable result of circumstances. Modern wars are different, and attacks are launched on different levels, exposing new vunerabilities in societies, he noted. "Today, Europe is peaceful not thanks to the wars that have been waged, but despite them," said Ratas. "Peace has a practical and emotional value to us; it is the way of living in the world and being human. Peace means acceptance of the knowledge that life is fragile and sacred." According to the Estonian head of state, Europe has had its share of good leaders who have implemented policies creating a safe living environment. "It is thanks to them that we know that the firm protection of human rights strengthens society and is invaluable in peace-building and peacekeeping," he said. "But we all need to contribute to and take responsibility for lasting peace — with each thought, word and act, no matter how different we are, and always without hesitation." Europe's common history should convince everyone that the EU helps withstand all expressions of hatred, greed and aggressiveness, Ratas noted. A common and agreed upon set of principles and rules are a way for countries to ease tensions that are bound to build up within Europe's common space. "Stressing this today, here, when we are commemorating the victims of all armed conflicts, shows that we have not forgotten our past," Ratas said in conclusion. "This is why, by the end of each new day, we try to be more fair-minded than yesterday — greater in spirit than ever before, in the name of peace and freedom."